Objectives: Midshaft clavicular fractures are increasingly treated operatively rather than nonoperatively. Studies have shown mixed results for both types of treatment. The aim of this study was to compare the early-stage functional status associated with open reduction and internal fixation (ORIF) with plating and that associated with conservative treatment for displaced midshaft clavicular fractures. Materials and Methods: A single-center retrospective review of the results of 120 cases of displaced midshaft clavicular fractures in patients aged 30–65 years old was conducted. The primary outcome was fracture union status at 6 months. Other outcomes were subjective shoulder value (SSV) scores, visual analog scale (VAS) scores, and radiographic shortening at 6 weeks, 3 months, and 6 months. The complication rates in the operative and nonoperative groups were recorded. Results: The delayed union rate at 6-month postoperatively and VAS scores at 6 weeks, 3 months, and 6 months postinjury were significantly higher in the conservative treatment group than in the ORIF group. SSV scores were significantly improved at 6-month postinjury in the ORIF group. Conclusions: This is the first study to discuss the importance of early-stage functional restoration after ORIF with plating for displaced midshaft clavicular fractures. This surgery leads to lower pain complications in the earlier stages of bone healing and lower delayed union rates compared with conservative treatment, in patients aged 30–65 years old. Jian-Yuan Chu and Kuang-Ting Yeha contributed equally to this work. Displaced clavicle fractures constitute one of the most common types of injury in fracture patients . The well-known indications for open reduction and internal fixation (ORIF) include open fractures, fractures in the lateral third region, floating shoulders, fractures combined with multiple ipsilateral rib fractures, and fracture complicated by compromised skin integrity . Since the reported complication rate for ORIF is as high as 34%, displaced middle-third clavicle fractures have mostly been managed conservatively, except for cases with skin tenting through the fracture fragment ,. However, more recent studies have demonstrated high nonunion rates in some conservatively managed subgroups ,. Current studies show that some patients have poor functional results after nonoperative treatment of middle-third clavicular fractures . Although primary plate fixation is a dependable technique for the treatment of displaced midshaft clavicular fractures, many patients with this condition clearly have acceptable functional recovery after conservative therapy without exposure to surgical risks . Moreover, some randomized controlled trials have shown improved functional outcomes after operative fixation . Early restoration of functional status is especially critical for patients aged 30–65 years old because they are generally eager to return to preinjury levels of work and daily activity. The aim of this study was to compare the results in patients in this age group who received ORIF with plating and those who received nonoperative treatment. This retrospective study was approved by the Research Ethics Committee of Hualien Tzu Chi Hospital, Buddhist Tzu Chi Medical Foundation (IRB106-155-B). This study was conducted in accordance with the Declaration of Helsinki and was approved by the local ethics committee of the institution. Informed written consent was obtained because the study was a retrospective data analysis. The data were collected through electronic chart reviews of patients who experienced displaced midshaft clavicle fractures and came to our institution for help and follow-up between April 2014 and December 2016. The inclusion criteria were as follows: (1) having a displaced middle-third clavicle fracture (Robinson type 2B1/2B2) , (2) age between 30 and 65 years, and (3) having a complete record of radiographic and functional evaluations at regular follow-up periods of at least 6 months. The exclusion criteria were as follows: (1) bilateral clavicle fracture, (2) fracture associated with other fractures or major injuries, (3) another trauma at the time of follow-up, and (4) initial injury combined with injured skin integrity or skin tenting of the fracture fragment. The patients were divided into those who received ORIF after injury (O group) and those who received conservative treatment and outpatient department follow-up (C group). The functional outcomes included the visual analog scale (VAS) score for pain (0–100)  and subjective shoulder value (SSV) score (0–100)  at 6 weeks, 3 months, and 6 months postoperatively. A poor radiographic outcome was delayed union or shortening of the fracture site by more than 2 cm compared with the other side at 6 months based on plain radiography of the clavicle. The rates of complications in the O group were also recorded, including implant failure or indication for revision surgery. The chart reviews and radiographic evaluations were performed by one orthopedic doctor who did not operate on any of the included patients. The fixation method in the O group was ORIF with one neutralization plate through a superior approach and with at least 6-cortex-purchase strength by the cortical screws at both sides of the fracture site. After surgery, all patients were provided with a sling for comfort and began an early active mobilization program, although resistance with the limb was avoided for 6 weeks postoperatively. The patients in the C group were protected with a figure-of-eight bandage  for 3 months and began an early rehabilitation program 6 weeks after injury. Statistical analyses were performed using SPSS 17.0 (SPSS Inc., Chicago, IL, USA). Statistical significance was set at P < 0.05 in all cases. Comparisons of data between the C group and O group were analyzed using independent t-test for continuous variables and the Chi-square test for categorical variables. The risk factors for delayed union in both groups and those of revision surgery in the O group were analyzed using the multiple regression method. Data from 500 patients were reviewed. After excluding cases that did not meet the inclusion criteria, we included 120 patients in the study, comprising 82 men and 38 women. Their mean age was 48.0 years. The patient data are shown in [Table 1]. Of these fractures, 85.8% were Robinson classification type 2B1, and 46.7% were over the side of the dominant hand. 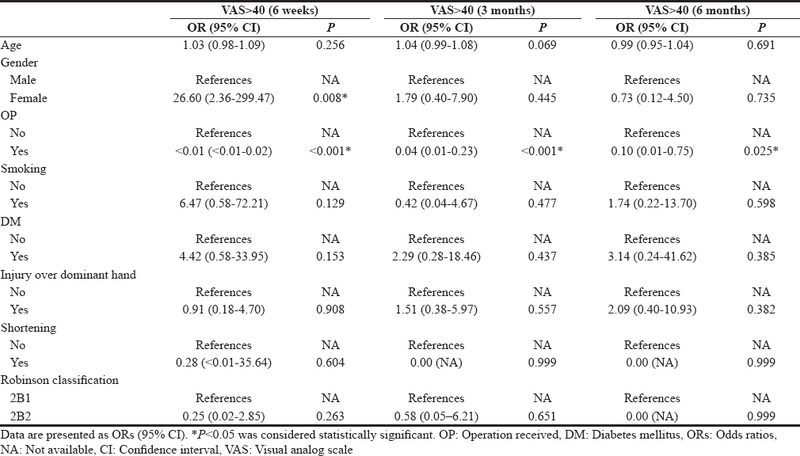 Most patients were nonsmokers and did not have diabetes mellitus (DM). The shortening of the fracture site ratio was 3.3%, the same in both the C and O groups. The primarily successful union rate in the O group was 90% [Figure 1]. There was no case of wound infection in the O group and the failure rate of ORIF was 10% (n = 6). Four of the patients had broken plates or screws after falls [Figure 2] and two other patients had loosening of the lateral site screws after heavy labor that had been prohibited by the surgeon. All received revision ORIF. There was a significantly higher ratio of delayed union at 6-month postinjury in the C group. 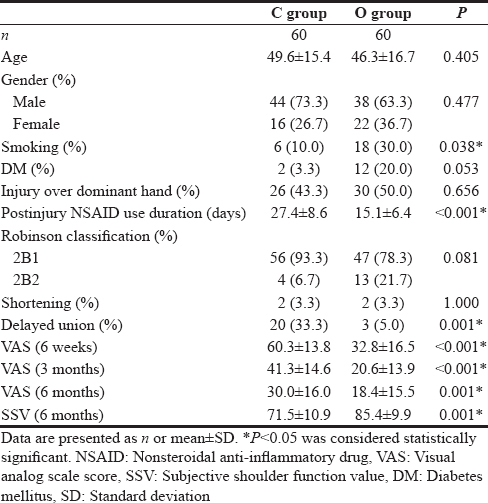 There was significantly less postinjury shoulder pain and lower SSV scores in the O group. The risk factors associated with delayed union and postinjury shoulder pain VAS scores are presented in [Table 2] and [Table 3], respectively. Only ORIF significantly lowered the risk ratio of these complications. 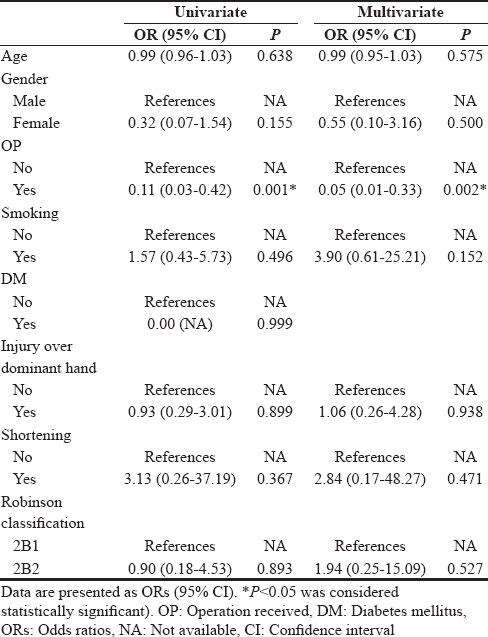 The risk factors related to revision surgery for failed ORIF in clavicle fracture are presented in [Table 4], revealing that smoking significantly increased the risk ratio. All 120 patients had achieved successful union at 2-year postoperatively. This retrospective study executed a comparative analysis between the O and C groups and determined the risk factors associated with revision surgery in the O group. A significantly higher delayed union rate at 6-month postinjury was noted in the C group compared with the O group. Research revealed that the prevalence of nonunion after nonoperative treatment was approximately 10%–15% . The absolute indication for midshaft clavicular fracture ORIF in our institution is skin tenting at the fracture site. For other types of midshaft clavicular fracture, we discuss the pros and cons of conservative treatment and surgical treatment in detail with patients and their families. Although primary fracture healing without surgical soft-tissue dissection occurred in the C group, unstable fixation with accidental movement of fracture fragments because of the mobility and high frequency of use of the upper limbs may have caused delayed union or even nonunion of the fracture site. This result may have a considerable effect on functional recovery and the duration of pain in the shoulder region. The duration of nonsteroidal anti-inflammatory drug (NSAID) use was also significantly shorter in the O group. Shorter period of NSAID usage is beneficial for the union of the fracture site because this medication may have a negative influence on fracture healing . The surgical method used in the O group relied on stable fixation with a neutral plate and at least 6 cortex fixations on each side of the fracture. This stable structure may considerably aid successful direct bone healing after open reduction, because 90% of the fixations had not failed at 6-month postoperatively. Previous studies reported complication rates for ORIF as high as 34% ,, including wound infection, surgical site infection, implant failure, and nonunion. Our complication rate of ORIF in the O group was 18.3%, including 3 cases of delayed union, 2 cases of fracture site shortening, and 6 cases of fixation failure that required revision surgeries. Through decreasing soft-tissue dissection and an accurate disinfection technique, complications such as surgical site pain, wound infection, and nonunion seemed to be decreased effectively. Multiple regression analysis further revealed that primary ORIF for displaced midshaft clavicular fractures decreased the risks of shoulder pain in the affected limb at 6-month postinjury and poor functional recovery at 6-month postinjury. This may be related to earlier fracture healing and early rehabilitation after ORIF, which is known to be a critical factor for functional restoration of the shoulder girdle. One study revealed no statistically significant differences in any of the functional outcome evaluation methods between early and late fixation of displaced midshaft clavicular fractures, and the authors suggested that operative intervention for clavicle fractures between 3- and 12-week postinjury may be safe with no risk of excess complications . However, our study results indicated improved functional restoration with ORIF for patients aged 30–65 years old, which may assist patients in returning to their preinjury social function, quality of life, and activity level in the early stage. This may be crucial because many of them were the main financial source for their family. Smoking seems to be a significant risk factor for the failure of ORIF for displaced midshaft clavicular fractures. All the patients who smoked required revision surgery. Smoking is known to be a major negative factor in bone- and soft-tissue healing . DM has also been determined to considerably influence sensitivity to pain and fracture healing . In our study, DM seemed to increase the risk of moderate-to-severe pain postinjury, although this did not reach statistical significance. The limitations of various types of analgesics because of DM nephropathy may also be another reason for this result. The limitations of the present study are the small sample size, short follow-up duration, and selection bias of surgeons between conservative treatment and surgery. However, this is the first study to reveal the relationship between treatment choice and early stage function or pain in the affected limb. Furthermore, delayed union did not equal nonunion. In the future studies, our goal is to determine the risk factors for nonunion of displaced midshaft clavicular fractures for longer follow-up periods. ORIF with stable fixation for displaced midshaft fractures seemed to decrease delayed union rates, restore more early-stage function, and decrease early-stage pain for patients aged 30–65 years old. Smoking may have a negative effect on the successful rate of the operation according to our result of this study. Lenza M, Faloppa F. Surgical interventions for treating acute fractures or non-union of the middle third of the clavicle. Cochrane Database Syst Rev 2015;5:CD007428. McKee RC, Whelan DB, Schemitsch EH, McKee MD. Operative versus nonoperative care of displaced midshaft clavicular fractures: A meta-analysis of randomized clinical trials. J Bone Joint Surg Am 2012;94:675-84. Gossard JM. Closed treatment of displaced middle-third fractures of the clavicle gives poor results. J Bone Joint Surg Br 1998;80:558. Toogood P, Horst P, Samagh S, Feeley BT. Clavicle fractures: A review of the literature and update on treatment. Phys Sportsmed 2011;39:142-50. Altamimi SA, McKee MD; Canadian Orthopaedic Trauma Society. Nonoperative treatment compared with plate fixation of displaced midshaft clavicular fractures. Surgical technique. J Bone Joint Surg Am 2008;90(Suppl 2) (Pt 1):1-8. 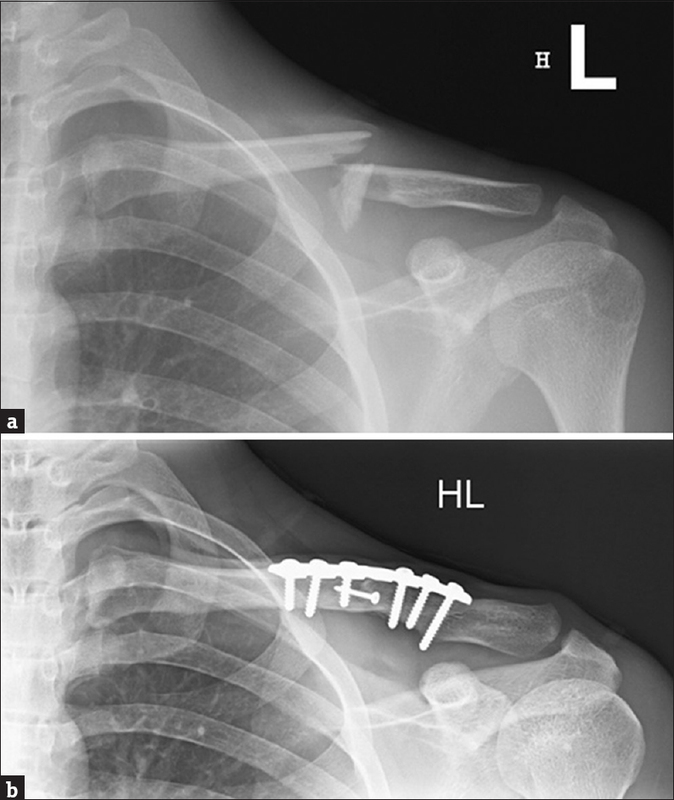 Bernstein J. Nonoperative treatment compared with plate fixation of displaced midshaft clavicular fractures. J Bone Joint Surg Am 2007;89:1866. Robinson CM, Goudie EB, Murray IR, Jenkins PJ, Ahktar MA, Read EO,et al. Open reduction and plate fixation versus nonoperative treatment for displaced midshaft clavicular fractures: A multicenter, randomized, controlled trial. J Bone Joint Surg Am 2013;95:1576-84. Woltz S, Krijnen P, Schipper IB. Plate fixation versus nonoperative treatment for displaced midshaft clavicular fractures: A Meta-analysis of randomized controlled trials. J Bone Joint Surg Am 2017;99:1051-7. Calbiyik M, Ipek D, Taskoparan M. Prospective randomized study comparing results of fixation for clavicular shaft fractures with intramedullary nail or locking compression plate. Int Orthop 2017;41:173-9. Knop C, Oeser M, Bastian L, Lange U, Zdichavsky M, Blauth M,et al. Development and validation of the Visual Analogue Scale (VAS) Spine Score. Unfallchirurg 2001;104:488-97. Gilbart MK, Gerber C. Comparison of the subjective shoulder value and the Constant score. J Shoulder Elbow Surg 2007;16:717-21. Lenza M, Taniguchi LF, Ferretti M. Figure-of-eight bandage versus arm sling for treating middle-third clavicle fractures in adults: Study protocol for a randomised controlled trial. Trials 2016;17:229. Dodwell ER, Latorre JG, Parisini E, Zwettler E, Chandra D, Mulpuri K,et al. 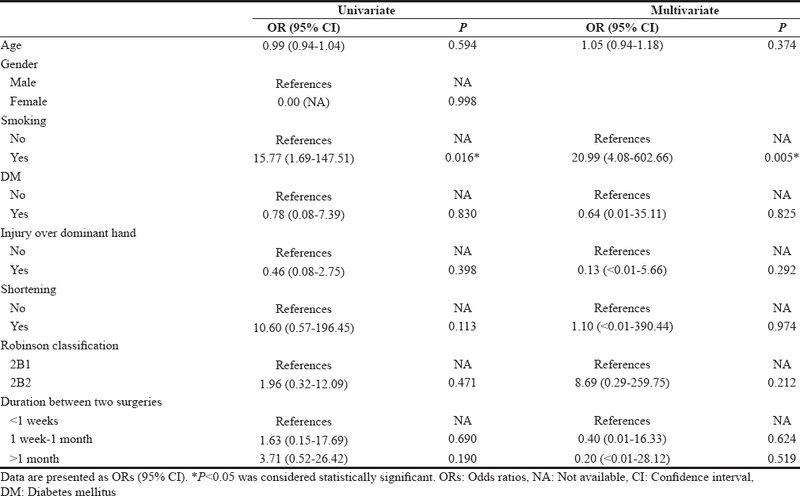 NSAID exposure and risk of nonunion: A meta-analysis of case-control and cohort studies. Calcif Tissue Int 2010;87:193-202. Das A, Rollins KE, Elliott K, Johnston P, van-Rensburg L, Tytherleigh-Strong GM,et al. Early versus delayed operative intervention in displaced clavicle fractures. J Orthop Trauma 2014;28:119-23. La Fontaine J, Chen C, Hunt N, Jude E, Lavery L. Type 2 diabetes and metformin influence on fracture healing in an experimental rat model. J Foot Ankle Surg 2016;55:955-60.